That has always been my philosophy. 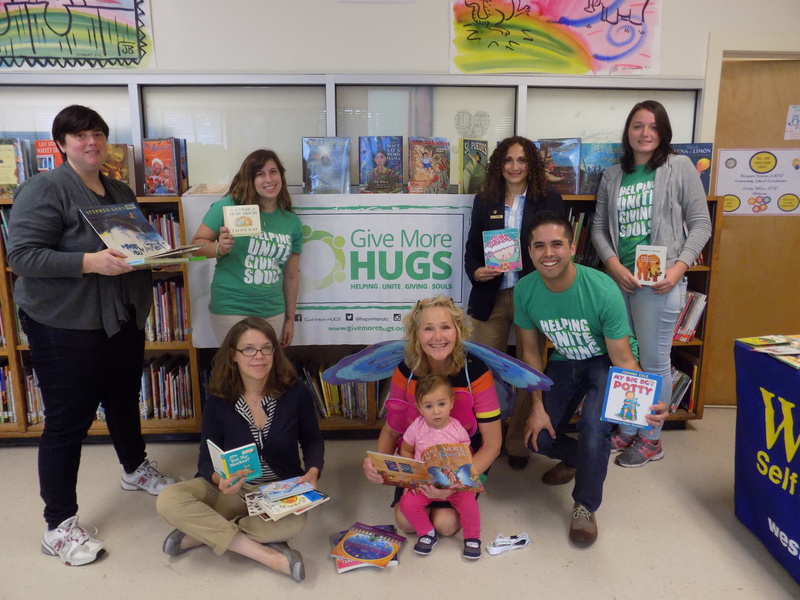 How perfect is it that my granddaughter and I have teamed up with an organization called GIVE MORE HUGS to entice more kids into the magic world of reading? What better advocate could we have for that group than the totally huggable little fairy? The great philosophy of this wonderfully named organization is carried out in its mission: to increase awareness about students in need and provide essential tools to help foster their academic success. The best tools for students are books — and the desire to read them. Give More Hugs has read the same studies as I have — if you own books and have them in the home, your children are more likely to do well in school. 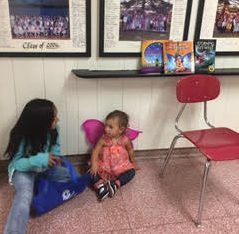 My little fairy apprentice and I went to two schools last week to a “BookShare” hosted by Give More Hugs. The group had collected gently used books, sorted them into different reading levels, teamed up with two schools in Port Chester New York and then invited the classes to come down one by one. Each student was allowed to pick out two books to take home to keep. My granddaughter and I were lucky enough to have the job of reading to the children after they had selected their books. 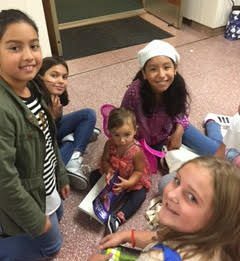 By the time the third group entered, my little fairy sat down next to my “reading chair” and patted the floor to get the kids to sit down next to her. Who could resist a magical reading Fairy that cute? That set me up to be the straight man. I told the students about the magical adventures they could take through reading. And even if they did not like fairies, I said, there are books on every subject, you can read about anything you want to. It was an utterly exhausting 3 hours. (Luckily the baby only crashed right about when it was time for me to leave.) But it was so worthwhile – to see how excited the children got that they now owned their own books. Their smiles were visible hugs! If you want to help keep the hugs going, go to the Give More Hugs website and find out how to join their team. And don’t throw out your old books — bring them to GIVE MORE HUGS. IndexCardCure one hug at a time!